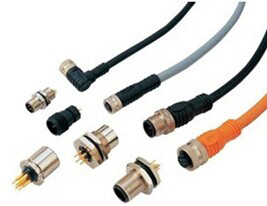 M8 connectors / M8 plugs, also called sensor connectors, have 3 pins, 3 sockets, 4 pins and 4 sockets. M8 waterproof sockets have 3 pins, 3 holes, 4 pins and 4 holes. M8 plugs with custom cable are directly poured into an organic whole by plug and cable. The length of the cable may be designated by customers such as 1 meter, 2 meters, 3 meters, 5 meters and 10 meters etc. There are some M8 straight connectors may be connected wires by customer self. The wires may directly plug into the screw holes then be twisted tightly by bolt. There is a type of M8 connector may be installed into PCB or soldered into PCB. It may take wires or not take wires. The installed screws may be chosen such as M8, M12, M16 and M18 and so on. The shape of M8 plug has straight connector and bent connector. Pins and sockets are gold-plated. Mating cycles are 1000 times. Our company, M8, M12, M16 and M18 waterproof connector manufacturer, is particularly good at customizing, designing and producing specialty products for global customers. A variety of the plugs and sockets with M8, M12, M16 and M18 screws and so on is available. The performance of water proof and dusty proof can reach IP 67 and over. Our customers come from these fields such as outdoor light boxes, construction machinery, iron and steel production equipment, power equipment, mining machinery, ship machinery, automotive equipment, automatic production equipment, temperature sensor, hydraulic machine, sensor, electromagnetic valve, instruments and meters, pressure transmitter, etc.